This post contains my referral links which helps support my free online work, which also blesses my family. Thank you for your support! Here’s my full disclosure policy. 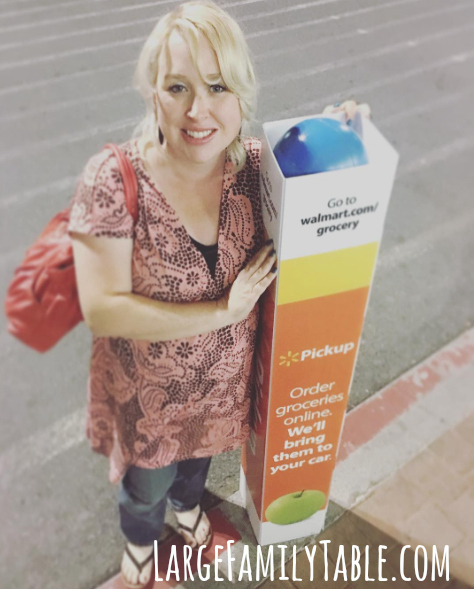 I shared on Instagram in April that Walmart Grocery Pickup is coming to several Walmarts near me. I’m well in my third trimester for my 8th pregnancy. In my first trimester, I had my standard extreme fatigue. In the 2nd trimester, I felt like I could do most of the things (like finally tackle creating my own home office). In my third trimester, I feel like I have a great big kid in my gut and the energy slowdown is king. I know in a few more weeks we’ll meet Benjamin David and my energy will pick up from there (although don’t worry, I rest well and for several weeks after each baby). 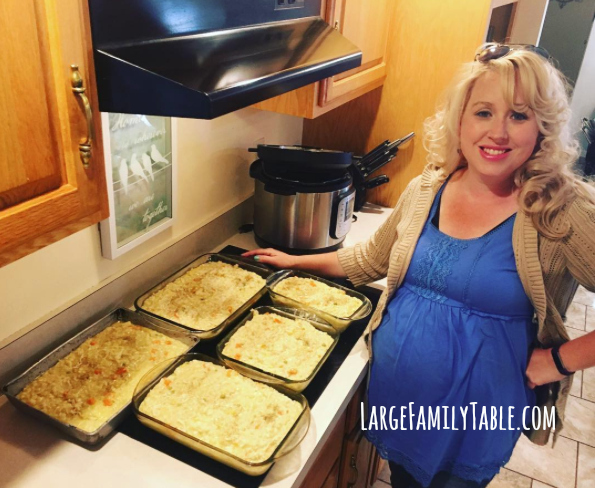 I love to talk about food for big families since I obviously manage so much of it around here. You can tell this by the large family grocery hauls I’ve shared for the last few years and my large family meal plans. However, as my belly continues to grow, I just do not want to set foot in a store if I don’t have to. My hobbies right now include sitting, laying down, and sitting. This is the most prominent reason I’m personally so excited about the Walmart Grocery Pick Up Service. What a lifesaver this could have been during so many non-poetic seasons over the years. 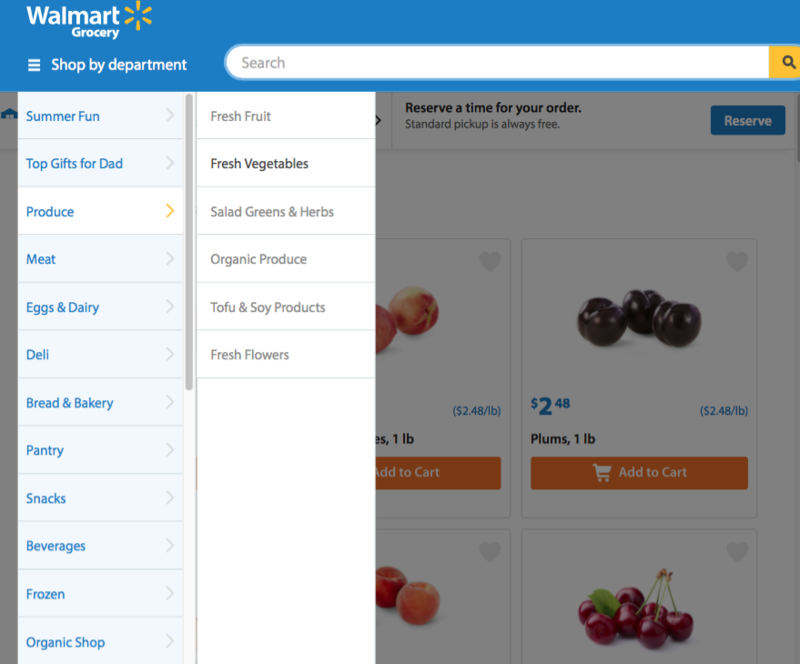 The idea of the Walmart Online Grocery Ordering and Pick Up Service is to order the groceries you need from the comfort of your own home. Then you schedule a time that’s convenient for you to pick up your ordered groceries. You show up at Walmart at your scheduled time slot. Just sit in your vehicle while Walmart staff loads your grocery order. After this, a staff member will go over your order with you. Then you drive home having saved tons of energy and effort from not having to go in the store. This is perfect for pregnant moms like me who cannot handle walking big stores right now. Also moms of little ones, working moms, tired moms, large family moms, all the moms. 🙂 I go into more details about how to place your actual order a little further down in this post. 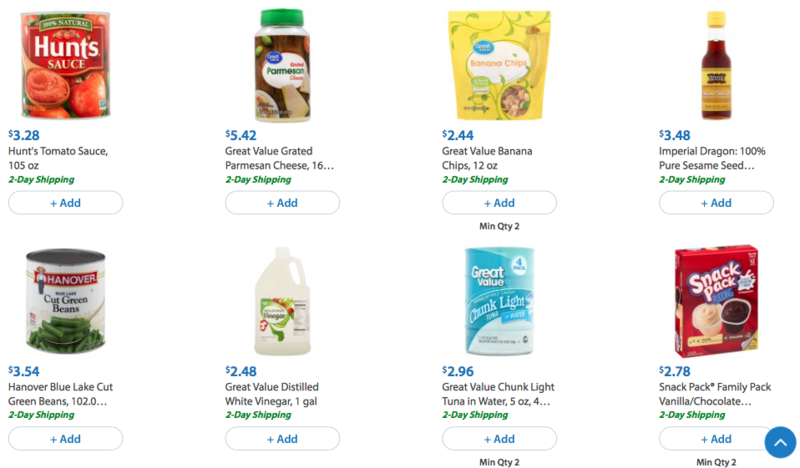 In early April, I stumbled onto the idea of having Walmart deliver all of our household and pantry items to our door. I figured getting the bulk of our household and pantry items delivered to the door would save time and energy as well. We wouldn’t be loading these items into carts and also hauling them home and unloading them once again. I tried Amazon Subscribe and Save a few times when my husband started back to college full-time two years ago. I felt boxed in with the commitment that the same items had to be delivered each month. Prices would change, our needs would change, and it was taking too much time trying to remember to check-in on the upcoming delivery each month. I like the Walmart Household delivery for pantry and household items because there is not a certain date commitment. I can choose to click and reorder favorite items whenever I like. There’s also an option where I can “heart” or favorite certain items, create specific lists, etc. Here is just a small sampling in the photo above of the non-perishable pantry items I’ve ordered through Walmart home delivery. With my new Walmart delivery attempt, I ordered everything I needed including our toilet paper, large breed dog food, diapers, household cleaners, and even my hair color. The best part is those items were delivered to my door for free in just 2-days! 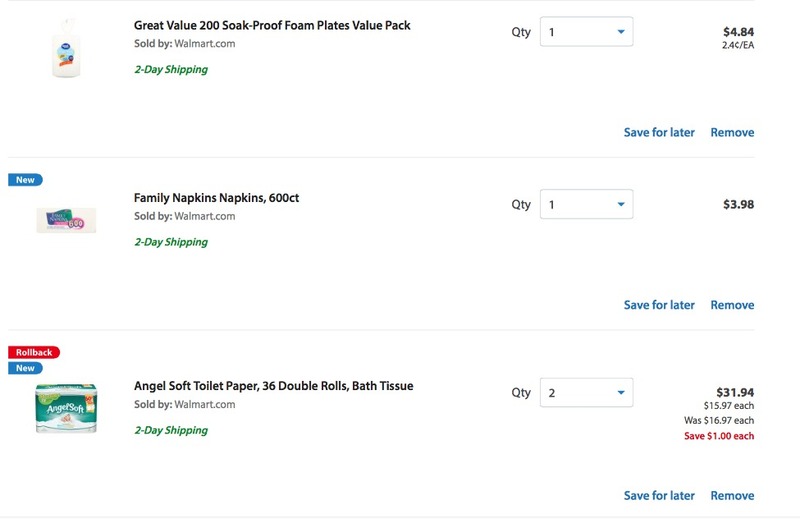 And again, the photo above shows a screen shot of some of the household items I’ve ordered through Walmart Home Delivery. This is a question I received on Instagram and here on Facebook (over 222 comments with other moms experience with Walmart grocery ordering, too!). To answer, I am not a brand loyalist. I’m a whatever brand is going to make my life easiest for whichever season I’m in kind of girl. I have loved and enjoyed ALDI for the past year that I’ve shopped there. I feel that ALDI is cheaper on many items. However, I’m willing to pay more if it equals several hours of time and energy savings in my world. This doesn’t mean I’ll never set foot in an ALDI again. I’m sure my energy will pick up, and I’ll actually want to go into a store again. But for now the option of sitting in the van while others shop for and then load my groceries, and I don’t have to go into a store, sounds amazing! I’ve shopped at Walmart for so many years that most of the price ranges are burned in my head. I can tell when there’s a deal and when something has an odd markup. Currently, the egg, milk, banana and bread prices at my ALDI and Walmart are within a few cents of one another. At this point, I have not seen where the online Walmart grocery prices are higher than the in-store prices. Again, by trying this Walmart Grocery Pick-Up Service, I’m saving time along with physical and mental energy. I don’t know about you, but I can never get out of the store in less than two hours it seems. It can take us 4+ hours if we’re doing a month haul. Then add on driving time on either end. It’s a lot of time buying and hauling food. Plus by placing my order online, I’m just getting what I need and not adding extras to my cart. 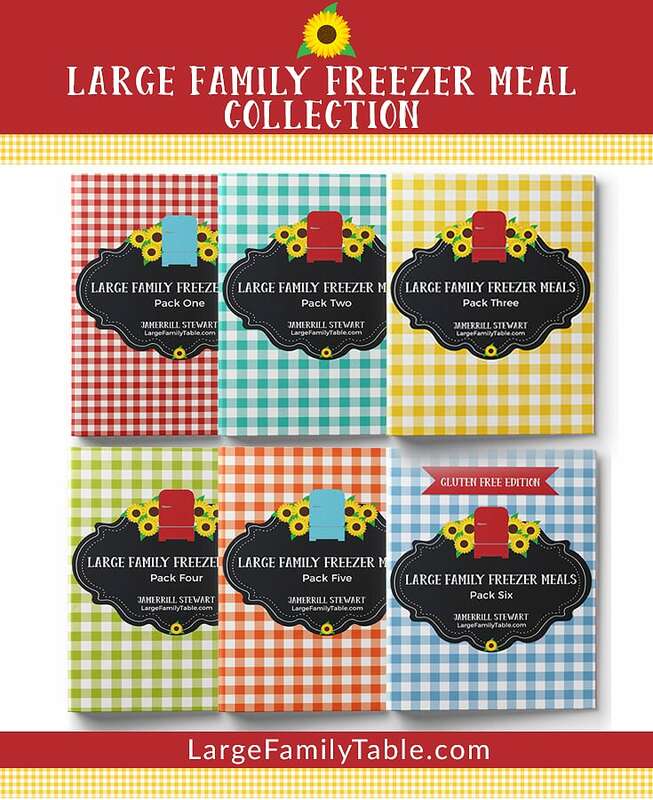 Also, with the time and energy savings of not even having to set foot in the store I’ve already been able to put that effort into filling my new freezer with large family freezer meals! Getting freezer meals together is something I haven’t been able to do consistently, even while not pregnant. 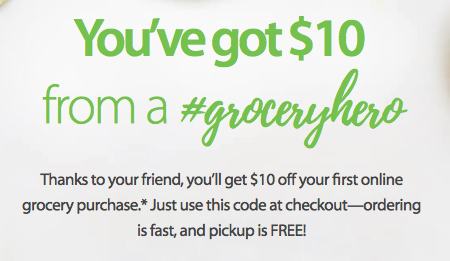 If you have a friend with a referral link, they can get you a coupon code to take $10 off your first online Walmart grocery pick-up order. If you’d like you can use my special referral link here which will give you $10 off your first order and will give me $10 of grocery credit added to my account. The first thing I did was go to the Walmart Grocery site and got my bearings on how the site operated. There is a drop down ordering menu on the top upper left of the site. You simply fill your online shopping cart with the produce, meat, eggs and dairy, bread, deli items, and any etcs you may need. I’ve since learned they also offer baby items, pet food, household items, and office supplies as well. Once the cart is full of the items you need, you can pick your free Walmart grocery pick-up time and proceed through check out. 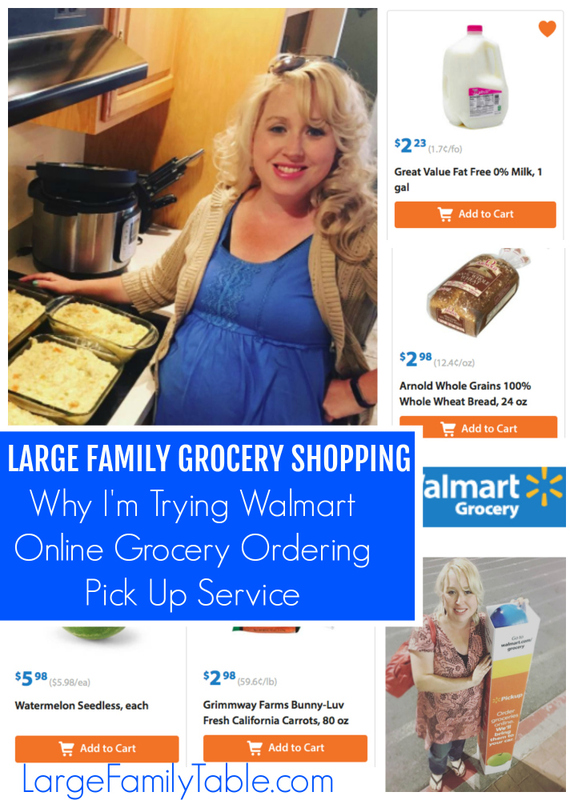 From my Large Family Table Instagram, read here what I did after placing my first Walmart Grocery Pick Up Order. I will share with you everything we purchased and my whole overall experience up next when I publish my first Walmart grocery haul vlog and cost analysis article. In the meantime, let me know if you’ve tried the Walmart Grocery Pick-Up service and your experience so far in the comments. Thanks for sharing! It really looks simple and the nearest one to me is about 20 minutes away! Can you work on your cart for a bit and save it to come back later? That’d be crucial for me? Oh yes! That’s what makes it possible for me, too.